Ever since The AIM Companies™ introduced the juice powder of barley grass back in 1982, the world as we know it was given the gift of health. Those who have made AIM BarleyLife® a daily part of their nutritional intake know it keeps them strong and healthy. For everyone else, it’s time to get on board the BarleyLife health insurance plan. The key to BarleyLife’s effectiveness is that it is first and foremost organic in nature, just like people. We are not synthesized in laboratories like so many synthetic supplements, including vitamins, minerals, etc. 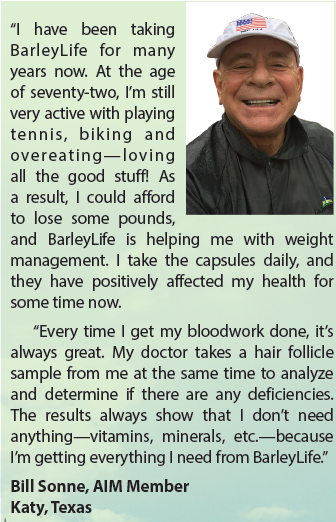 People are natural and respond exceedingly well to the rich, natural source of nutrients in BarleyLife: vitamins, minerals, chlorophyll, antioxidants, phytonutrients and enzymes. It’s a fact: cattle that graze on grass grow strong and healthy. But people can’t chew on blades of grass and expect the same results. That’s why AIM extracts all of the nutritional wealth from barley grass to make it bioavailable for people in a juice powder. These incredible greens are easily absorbed, providing an unparalleled concentration of natural nutrients for the body to build healthy cells—the foundation of strength and health. For those who still cannot wrap their minds around drinking grass in a glass, BarleyLife comes in capsules as well. That means there is no excuse for not taking BarleyLife to keep you strong and healthy.